This problem follows on from Isometric Areas. Each of the triangles below has at least two edges whose side lengths are whole numbers. For example triangle $B$ has sides of length $3$ and $4$. 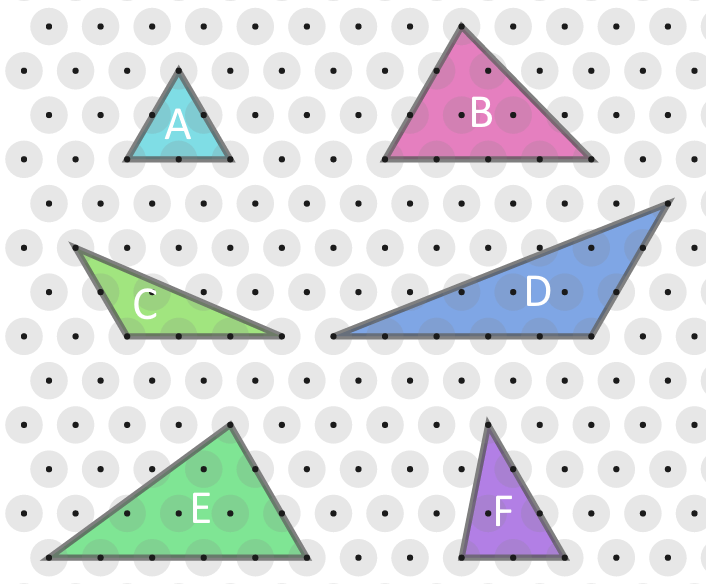 Work out the area, in terms of $T$, of each of the triangles. Compare the areas to the whole number side lengths. Can you explain what you have noticed? You might like to try Of All the Areas next. 2D shapes and their properties. Visualising. Ratio. Sine, cosine, tangent. Triangles. Area - triangles, quadrilaterals, compound shapes. Interactivities. Pythagoras' theorem. Generalising. Quadrilaterals.